We’d love your help. Let us know what’s wrong with this preview of The Chancellor Manuscript by Robert Ludlum. To ask other readers questions about The Chancellor Manuscript, please sign up. what is the plot ? any difference b/w Bourne series ? My grandmother gave me a bag of Ludlum books when I was in the hospital after a motorcycle accident when I was 19. I read this book first and was completely blown away. I didn't know reading could be like that. It started me reading. After I read all of Ludlum's books I looked for other authors to read. I will always be grateful to my grandmother. Ludlum's books are always a great ride and this one is not an exception. I love how the plot tightens up as you reach the finale: incredibly tight! It makes me want to read the bourne series again. Ludlum'as yra žinomas kaip vienas geriausių, nuosekliausių spy-fiction ir konspiracijos teorijos stiliaus žanro autorių, kurio daugelis knygų tapo superhitais ir/ar buvo ekranizuotos, neiškiriant ir populiariosios Borno trilogijos. Šita knyga, nors ir ne itin panaši į Borną (į kino versiją, kuri nuo knygos skiriasi ohoho kaip) išlaiko tuos pačius bruožus - nedidelį tempą, gan lakoniškus dialogus, mažai sąmonės srauto bei aplinkos aprašymų, keletas įtemptų veiksmo scenų. Žodžiu, visai neblogas ko Ludlum'as yra žinomas kaip vienas geriausių, nuosekliausių spy-fiction ir konspiracijos teorijos stiliaus žanro autorių, kurio daugelis knygų tapo superhitais ir/ar buvo ekranizuotos, neiškiriant ir populiariosios Borno trilogijos. Šita knyga, nors ir ne itin panaši į Borną (į kino versiją, kuri nuo knygos skiriasi ohoho kaip) išlaiko tuos pačius bruožus - nedidelį tempą, gan lakoniškus dialogus, mažai sąmonės srauto bei aplinkos aprašymų, keletas įtemptų veiksmo scenų. Žodžiu, visai neblogas kokteiliukas tokio žanro mėgėjams. Į turinį pernelyg neišsiplėsiu, bet verta paminėti, kad žaisti su skaitytoju autorius tikrai moka. Jau knygos viduryje supratau, kas yra tikrasis blogiukas, tada, pačioje pabaigoje smarkiai tuo suabejojau tik tam, kad prieš pat pačia pabaigą suprasčiau, jog buvau teisus. Ir tada viskas apsivertė aukštyn kojom. Taigi, galiu garantuoti, kad čia nebus tas detektyvas, kuriame jau knygos viduryje paaiškėja, kas blogietis. For the most part, this novel was a slow read and not one of Ludlum's best. The end does pick up. There are a couple of twists and surprises, but maybe there are just too many layers of deception in this story. I feel this novel is proof that Ludlum had an inside source in the intelligence world. I have thought this before concerning some of his other works. Robert Ludlum, like Peter Chancellor, is being fed information from those in the know. That much is obvious and Ludlum has made that clear. For the most part, this novel was a slow read and not one of Ludlum's best. The end does pick up. There are a couple of twists and surprises, but maybe there are just too many layers of deception in this story. I feel this novel is proof that Ludlum had an inside source in the intelligence world. I have thought this before concerning some of his other works. Robert Ludlum, like Peter Chancellor, is being fed information from those in the know. That much is obvious and Ludlum has made that clear. Despite it is quite a big & heavy edition, I read this before going to sleep (and in the many sleepless hours I had this werk). I liked the book. It's interesting, well written, fast paced and it contains quite a plausible story. I also happen to love (non-)fiction about espionage/intelligence and the agencies that are behind that, so the story about Hoover's personal archive rung a bell. Too bad it's finished, this was a good one! This review has been hidden because it contains spoilers. To view it, click here. Excellent thriller by Robert Ludlum, a page-turner no-doubt. Ludlum may not be the easiest author to read, as too often the contents of his prose is ten steps ahead of the reader. Plus the author tends to sacrifice clarity over complex intrigue. That said, what Ludlum delivers in "The Chancellor Manuscript" is both engaging and entertaining, leaving the reader on the edge through each and every chapter. There is a part of me that STILL does not understand what happened in "The Chancellor Manuscri Excellent thriller by Robert Ludlum, a page-turner no-doubt. Ludlum may not be the easiest author to read, as too often the contents of his prose is ten steps ahead of the reader. Plus the author tends to sacrifice clarity over complex intrigue. That said, what Ludlum delivers in "The Chancellor Manuscript" is both engaging and entertaining, leaving the reader on the edge through each and every chapter. Who ordered the first assassination attempt on Chancellor's life, the one that killed his fiancee Cathy? What is Varak, via Inver Brass? Then Munro St. Claire later decides to use Chancellor as a means to flush out the people who stole half of J. Edgar Hoover's private files, after Inver Brass has Hoover murdered. So Varak is then assigned to program Chancellor into conspiracy madness by carefully feeding the author information that he should use for his next book. Yet Varak is a master manipulator, and mixes both truth and lies together in order to further drive Chancellor out of his mind. But...something goes wrong, It's kind of brilliant when you think about it, yet hard to grasp onto when you are reading it for the first time. In essence, the master manipulator (Varak) gets out-manipulated by an unknown force, who speaks a bizarre and utterly foreign tongue. Yet since Varak can not be trusted as a conduit of truthful information, one never knows whether whatever he is saying or doing is part of the truth, or just another manipulation. Speaking of manipulation, which came first...the manuscript, or the Chancellor's real-life story? Varak fed information to Chancellor, who eventually put it in his manuscript, as he did with everything else that happened to him. But...some elements of his life mirrored exactly what he had had previously written. Was that be design, or just happenstance? Was the entire story just an author's fantasy come to life? I still don't know. Then there is the whole "Chasong" business. What was that all about? Was it just a red herring, or something significant? Ludlum keeps you guessing, and guessing again. However, when the "truth" is finally revealed...it STILL does not make sense. Something about a General's wife, whose parents were prisoners of the Chinese during the Korean war, who fed info to the Chinese, then was caught, and forced to become a drug addict and whore, then used to feed misinformation to the Chinese...okay. Then she is raped by a black man. THEN, to stop her husband the General from asking questions, the evil military leaders manipulate the General into leading an all-black battalion into slaughter at Chasong. What??? Does not make sense, yet this plot point is key to the whole manipulation. Having just read this book, I feel as if I've just been let off a maddening, yet thrilling merry-go-round. Ludlum has written a thriller with the premise that J. Edgar Hoover, the infamous Director of the Federal Bureau of Investigation (FBI), did not die a natural death in 1972, but had been murdered. One of the principal characters is Peter Chancellor, a man in his 30s, who had failed in his defense of a Ph.D thesis into which he had devoted 2 years of his life. (It was a highly controversial Having just read this book, I feel as if I've just been let off a maddening, yet thrilling merry-go-round. Ludlum has written a thriller with the premise that J. Edgar Hoover, the infamous Director of the Federal Bureau of Investigation (FBI), did not die a natural death in 1972, but had been murdered. One of the principal characters is Peter Chancellor, a man in his 30s, who had failed in his defense of a Ph.D thesis into which he had devoted 2 years of his life. (It was a highly controversial thesis, which called into question various historical events which had been played out on the world stage between 1926 and 1939.) Frustrated, Chancellor makes his case to an old authority figure (Munro St. Claire) who wielded considerable influence within Chancellor's school. St. Claire advises Chancellor to take up a new career, suggesting fiction. With nothing left to lose, Chancellor embarks upon a literary career, writing over the next 4 years 2 best-selling novels whose conspiratorial themes would lead to Chancellor's life being turned inside out. "When making a contact, position was everything. Protect yourself by being able to observe all approaching vehicles; keep rapid, undetectable escape available. "Friends were enemies, and enemies taught one strategies with which to fight them. It was part of the insanity that was all too real." This was my 2nd reading of this book. I had first read it when I was in school, somewhere in the 90s. All I remembered was I smuggle-read this book in school to race through it. 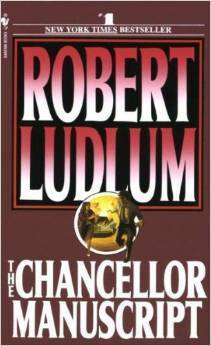 The Chancellor Manuscript is a typical Robert Ludlum signature book. Unlike his other books, this one is set COMPLETELY in the USA and the pandemonium of crisis eats away at the heart of the US administration. This book is unique because there is a constant conflict AND merger of fiction and reality. It's like a plot wit This was my 2nd reading of this book. I had first read it when I was in school, somewhere in the 90s. All I remembered was I smuggle-read this book in school to race through it. The Chancellor Manuscript is a typical Robert Ludlum signature book. Unlike his other books, this one is set COMPLETELY in the USA and the pandemonium of crisis eats away at the heart of the US administration. This book is unique because there is a constant conflict AND merger of fiction and reality. It's like a plot within a plot within a plot. By the time you finish you may have to take some time to swim out of the cesspool you had been thrown into. This is one classic Ludlum work because of its myriads of twists in the tale, the deceptions and the counter deceptions, the encompassing crisis, the spiralling of violence, the clinical process of murder and of course a high level of intelligence in every single step. It will keep you wondering "what if"? It will make you think "is there any fact to fiction"? THE CHANCELLOR MANUSCRIPT is a top-notch thriller with perhaps the most convoluted story line I've ever seen. Only an incredibly masterful writer would even attempt something like this, let alone be able to pull it off. Which Ludlum does, for the most part. Definitely not recommended unless you want to give your brain a workout. This is one book I would suggest reading through as quickly as possible so as not to lose track of the plot. This is my favorite Ludlum book of all time. I devoured it. It has a bit of historical fiction in it but stays the espionage course as well. I would rate it "R" if it were a movie due to language and some scene description but it's a great read if you like spy novels. Ludlum is a master storyteller. not better than the previous books I read which were total monsters, but nonetheless amazing. this is a Mystery Spy thriller that, with no surprise, contains many twists and turns. This book doesn't just contain one simple plot, but much much more...Alot more. The best Ludlum novel ever, and very timely story line with what is going on in today's world. A must read for lovers of the thriller genre. This was the first and last Ludlum book I read. I found it tedious. Too many details and not enough suspense for what is supposed to be a suspense/action novel. This is a non-stop thriller by a master at the top of his form. Great story, characters and plot. Enjoyed this! I found the initial premise intriguing because set in 1968 unmasking US businessmen who traded with Nazi Germany is something which was later done well in books such as 'IBM and the Holocaust'. But in 1968 it's a no-no that sets the main character, Peter Chancellor, off on fictionalising real history to be able to tell the stories he only has some, or only confidential, sources on. Chancellor has a good thing going until a tragedy intervenes. This is my first "Hmm" later on - the r Enjoyed this! I found the initial premise intriguing because set in 1968 unmasking US businessmen who traded with Nazi Germany is something which was later done well in books such as 'IBM and the Holocaust'. But in 1968 it's a no-no that sets the main character, Peter Chancellor, off on fictionalising real history to be able to tell the stories he only has some, or only confidential, sources on. Chancellor has a good thing going until a tragedy intervenes. This is my first "Hmm" later on - the reasoning for this is never as clear as would be wanted by the end. But eventually he is "programmed" or led, if one will, to investigate Hoover's death and what happened to secret files. This plays out well, mostly, and we know that things are not always as they seem as we are able to see the other side trying to manipulate him. The denouement required me to go lie down in quiet and try to make sense of it and it was quite difficult to really get a grip on it all! I did understand it, but it was difficult to understand what exactly it really had to do with anything. This is very poorly written. Ludlum' prose is overly dramatic and downright cheesy, with an irritating need to punctuate the drama with excessive use of exclamation marks! Why such a high score then? Because it's astonishingly well plotted. The central conspiracy has some genuinely surprising revelations and in its latter third the level of escalation is really quite thrilling. Sure, it's silly, but I gladly ate it up. The villain group was so larger than life, it is truly difficult to digest. But the plot is superb. It has so many layers, the mystery gets solved in so many twists. & the central crime is so unspeakable. The characters are mainly very believable. Even the individual members of the unbelievable villain group. One thing is, I really felt SCARED reading this novel, I'm not sure why. I took 2 days to read this. Both nights, I couldn't sleep alone. Another great read, for the second time! I read this book years ago and decided to re-read. I had forgotten most of the book. I enjoyed it as much as ever. It is so today, written as fiction, but could be so real life! I'm going to read some more of his books that I have previously read. Such a great story teller. I read it right after finishing 'The Bourne identity'. I just loved it, not only because the plot is quite interesting, but also the structure, quite complex. Nevertheless, Ludlum solves it amazingly well. p278: they flashed agin, as if aimed at him! p305: "...he resolved a personal quandry i was in...."
I have read this book several times, it's a great read and leaves you wondering is it really just a novel? Confusing with such twisted plot but unable to stop reading. Makes one wonder how much is fiction and how much could possible be true. Il manoscritto, in originale "The Chancellor Manuscript" è un romanzo di spionaggio scritto da Robert Ludlum e pubblicato nel 1977. Si tratta di un romanzo sui presunti file segreti di J. Edgar Hoover e come sono scomparsi dopo la sua morte, e come, eventualmente, potrebbero essere utilizzati per ricattare persone di potere per eseguire gli ordini di coloro che possedevano tali segreti. E' anche ipotizzato che Hoover stesso potrebbe essere stato assassinato perché sapeva troppo di molte persone Il manoscritto, in originale "The Chancellor Manuscript" è un romanzo di spionaggio scritto da Robert Ludlum e pubblicato nel 1977. Si tratta di un romanzo sui presunti file segreti di J. Edgar Hoover e come sono scomparsi dopo la sua morte, e come, eventualmente, potrebbero essere utilizzati per ricattare persone di potere per eseguire gli ordini di coloro che possedevano tali segreti. E' anche ipotizzato che Hoover stesso potrebbe essere stato assassinato perché sapeva troppo di molte persone potenti. Nel gennaio 2010 il regista Marc Forster ha acquisito i diritti del romanzo per farne un film. Leonardo DiCaprio è stato contattato per il ruolo principale e Peter O'Brien per scrivere la sceneggiatura per il film. Robert Ludlum, come già detto molte volte nelle mie precedenti recensioni è un maestro indiscusso del genere spy-story, tanto da meritarsi l'appellativo di "Mr. Plot" -signor complotto-. Ha scritto 27 romanzi thriller. Il numero di copie dei suoi libri in stampa è stimato tra 290 milioni e 500 milioni. I suoi libri sono stati pubblicati in 33 lingue e 40 paesi. Ludlum ha anche pubblicato romanzi sotto gli pseudonimi di Jonathan Ryder e Michael Shepherd. È diventato celebre per la serie di romanzi "The Bourne Identity" ai quali sono stati vagamente ispirati tre film. La trama di questo romanzo: nel prologo il protagonista incontra un ambasciatore degli Stati Uniti, ed espone la sua tesi in merito ai segreti di Hoover ma viene respinta; l'ambasciatore però lo convince a pubblicarla sotto forma di un romanzo. Il protagonista accetta con riluttanza, e diventa presto un famoso romanziere. L'ambasciatore si rivela però facente parte di un'organizzazione conosciuta come "Inver Brass" che è in realtà un gruppo di intellettuali che intervengono nelle questioni politiche e economiche quando pensano che stanno andando fuori pista. Questi intellettuali decidono di assassinare J.Edgar Hoover, capo della FBI, perchè ritengono che i suoi file privati contengono informazioni dannose su vari politici, militari ed altre figure molto importanti, e che Hoover utilizza queste informazioni per il loro controllo . Quando Hoover viene assassinato dal lavoro del geniale ufficiale Stefan Varak, la metà dei file non si trovano. Per ottenere i file rimanenti Inver Brass recluta Peter per arrivarci, dandogli un nuovo soggetto per il suo romanzo, dicendogli che Hoover è stato assassinato in modo che indagherà ulteriormente. Da qui Peter è intrappolato in una spirale violenta, non sapendo chi sono i suoi nemici. Ludlum si conferma maestro di articolazione della trama, colpi di scena e dialoghi veloci e ben strutturati. Anche il soggetto della trama è intrigante e rileva una parta della storia americana che è sempre stata poco chiara. Sicuramente non posso dire che sia il libro migliore dell'autore, ma il romanzo si gusta appassionatamente. La parte finale è un capolavoro per intensità e suspense, con ovviamente risvolti imprevedibili.